Highly secure global communication based on quantum key distribution could eventually be made possible by swarms of tiny CubeSats. Singapore and the United Kingdom want to demonstrate that possibility through a US $13 million international project aimed at launching a small quantum communications satellite by 2021. The announcement comes almost exactly a year after Chinaâs pioneering demonstration of how a satellite can hand off secret one-time keysâ"made theoretically unhackable by quantum physics principlesâ"between ground stations located halfway across the world. By developing a quantum satellite in a much smaller and more affordable package, Singapore and the United Kingdom could hasten global deployment of quantum satellite constellations capable of connecting cities worldwide. âNobody has ever tried to do this with a small satellite,â says Alexander Ling, head of the Centre for Quantum Technologies at the National University of Singapore. The Singapore-U.K. proposal for quantum key distribution relies upon pairs of photonsâ"single particles of lightâ"that exist in a state of quantum entanglement. Changes to one photon can affect its entangled buddy, which allows the entangled photons to act as identical quantum messengers for carrying secret keys that could encrypt video calls or other data transmiss ions. Meanwhile, a spy attempting to intercept the secret key would be foiled by quantum physics. The mere act of trying to read the information contained in the photons would change their state and tip off the recipient that the key had been compromised. A satellite-based quantum key distribution network could offer a hack-proof alternative to the usual public-key algorithms that handle almost all of the worldâs data communications used in modern banking and payment systems. China has forged ahead as the leader in setting up both ground-based fiber networks for exchanging quantum keys and in testing the possibility of satellite quantum communications networks. In 2016, China launched the worldâs first quantum satellite and subsequently carried out several demonstrations for satellite-based quantum key distribution. A joint Singapore-U.K. team also set a quantum communications benchmark in the same year that the Chinese satellite launched. 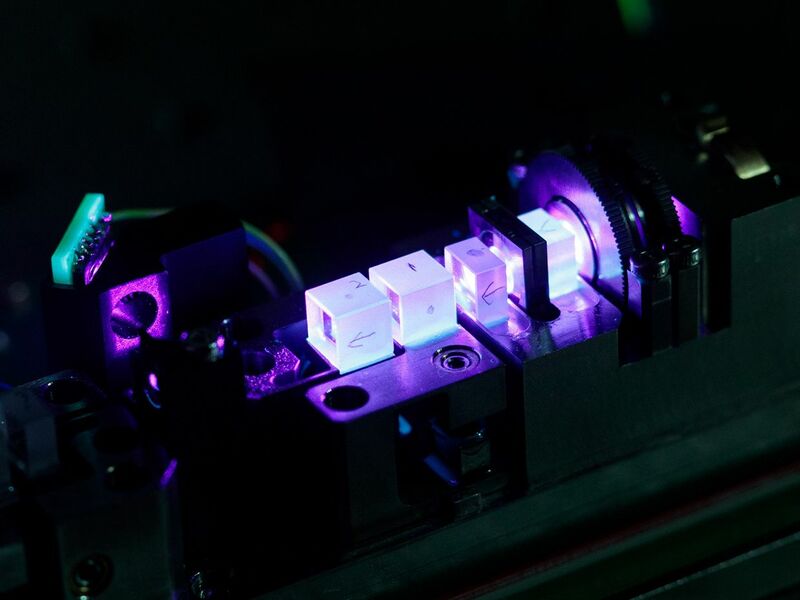 Before Chinaâs launch, the Singapore-U.K. group successfully launched and tested a compact quantum system that could create and measure correlated pairs of photons as a precursor to creating entangled pairs of photons. The latest and much more ambitious Singapore-U.K. effort puts a special twist on the quantum satellite concept by trying to make it work within the small size constraints of a CubeSat. Whereas the Chinese quantum satellite weighs in at more than 600 kilograms, the final design for the Singapore-U.K. satellite dubbed âQKD Qubesatâ may end up being closer to 12 kg and roughly the size of a shoebox. Quant um key distribution (QKD) creates encryption keys from individual photons. This device uses lasers and crystals to create the type of signals required for QKD. Putting a quantum communications system on a much smaller satellite means there is little room for redundant backup systems, in case part of the system fails. Singaporeâs Centre for Quantum Technologies has already tested its systemâs capability to survive harsh conditionsâ"including simulated launch vibrations aboard a rocket and extreme temperature cycles similar to those found in space. âIâm pretty happy to say that the last round of testing weâve been doing shows the system holds up under fairly dramatic conditions,â Ling says. Another big challenge for the tiny quantum satellite is successfully transmitting a key contained within a photon from space to Earth. That photon handoff requires precise alignment between a telescope aboard the quantum satellite and a telesc ope at the ground station. For a tiny CubeSat, maintaining telescope alignment will require the entire satellite to continuously adjust its orientation in orbit as it tracks the appropriate ground station. Until recently, such precise control would have been tricky to achieve aboard a tiny CubeSat. Thatâs where the expertise of the U.K. team comes in handy. The U.K. Science and Technology Facilities Councilâs RAL Space group in the Rutherford Appleton Laboratory is in charge of developing both the CubeSat platform and the optical tracking for the telescope that can achieve extreme pointing accuracy and precisely track ground stations. The QKD Qubesat announcement kicks off what Vick describes as a âvery intense 24-month design-development periodâ going from early concept to final design. Itâs far from the only effort to shrink quantum communications systems into a CubeSat-size package. But if all goes well, the globe-spanning cooperation of the Singaporean and U.K. scientists and engineers may achieve another first in the race to deploy quantum communications in space.